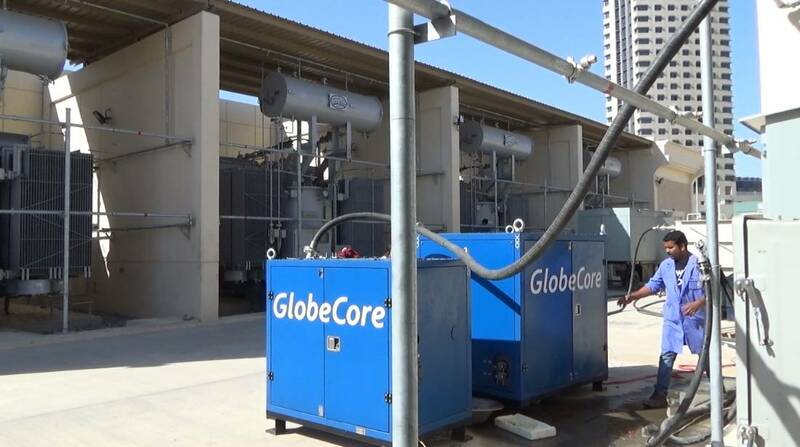 On June 11-12, 2016 GlobeCore engineers have commissioned a CMM-4/7 degassing plant and BV-1000 vacuum unit at one of the new Kuwaiti transformer substations (Al Kuwait). The practice of commissioning modules consisting of several units is not so rare in electric power industry and is perfectly justified. In this case, it helps to resolve several important tasks simultaneously. The CMM-4/7 unit is capable of treating power transformers with vacuum as well as purifying electrical insulating oils, removing mechanical impurities, water and gases. This equipment can be used in the following modes: transformer heating mode, oil degasing mode and transformer vacuum treatment mode. In heating and filtration mode the maximum capacity is 7 m3/hour, and in degasing mode it is 4 m3/hour. The BV-1000 vacuum unit is applied to evacuate air, non-aggressive gases, vapors, and gas-vapor mixtures out of air tight vacuum systems at geometric rate of 1000 m3/hour. This equipment is capable of creating vacuum in transformer tanks and drying electrical equipment. An important benefit of the BV-1000 is the ability to be combined with transformer oil degasing plants. We also note that all testing and commissioning works in Al-Kuwait were performed in severe weather conditions. Ambient temperature was reaching +50ºС, but GlobeCore equipment coped with performance targets flawlessly.